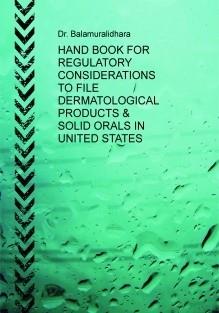 The book revolves around the specific regulatory requirements that govern the approval prospects of the Topical Dermatological products & solid orals. It is vital for pharmaceutical industry to handle with the regulatory requirements for betterment of public and to ensure their place in the market. The regulatory requirements of various dosage forms vary from each other. Therefore, it is challenging for the companies to develop a documents. The topics covered in the study include an outline of the essentials of dermatological product & solid orals as well as comparison of regulatory guidelines for the generic approval in United States of America (USA).